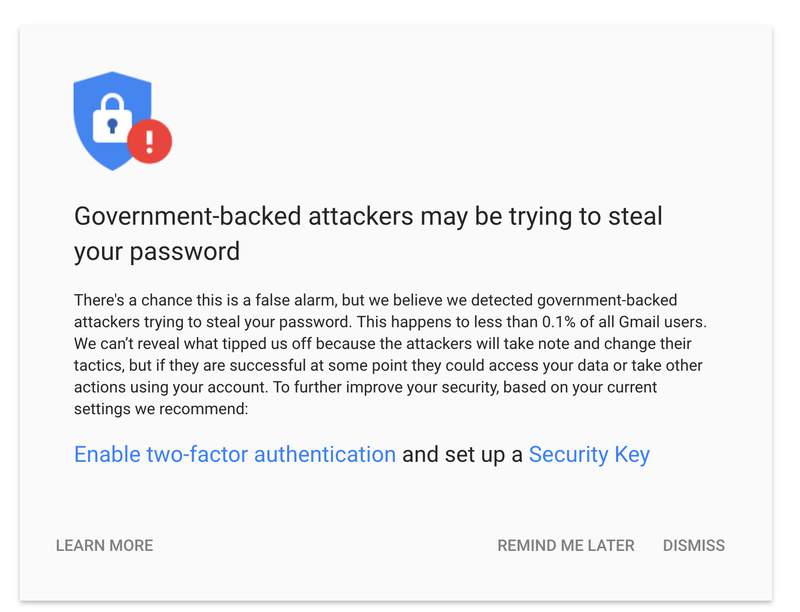 Since 2012, we’ve warned our users if we believe their Google accounts are being targeted by government-backed attackers. We send these out of an abundance of caution — the notice does not necessarily mean that the account has been compromised or that there is a widespread attack. 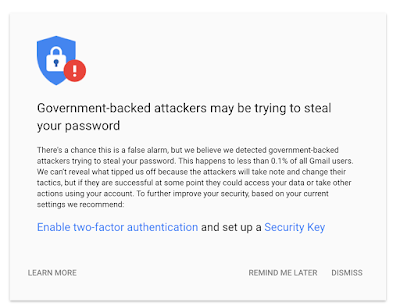 Rather, the notice reflects our assessment that a government-backed attacker has likely attempted to access the user’s account or computer through phishing or malware, for example. You can read more about these warnings here. In order to secure some of the details of our detection, we often send a batch of warnings to groups of at-risk users at the same time, and not necessarily in real-time. Additionally, we never indicate which government-backed attackers we think are responsible for the attempts; different users may be targeted by different attackers. Security has always been a top priority for us. 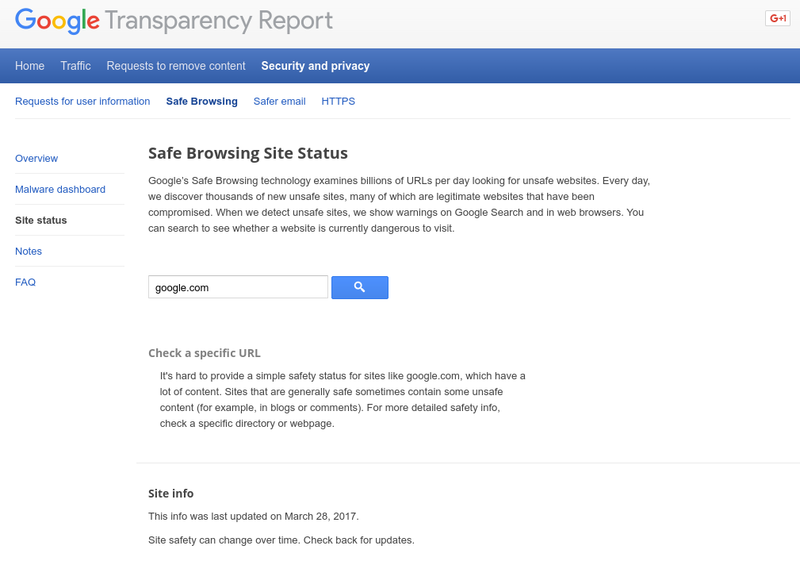 Robust, automated protections help prevent scammers from signing into your Google account, Gmail always uses an encrypted connection when you receive or send email, we filter more than 99.9% of spam — a common source of phishing messages — from Gmail, and we show users when messages are from an unverified or unencrypted source. 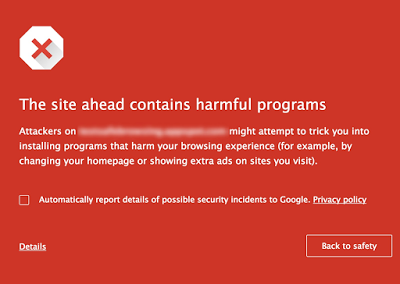 An extremely small fraction of users will ever see one of these warnings, but if you receive this warning from us, it's important to take action on it. You can always take a two-minute Security Checkup, and for maximum protection from phishing, enable two-step verification with a Security Key. Today, we’re sharing the third annual Android Security Year In Review, a comprehensive look at our work to protect more than 1.4 billion Android users and their data. Our goal is simple: keep users safe. In 2016, we improved our abilities to stop dangerous apps, built new security features into Android 7.0 Nougat, and collaborated with device manufacturers, researchers, and other members of the Android ecosystem. For more details, you can read the full Year in Review report or watch our webinar. It’s critical to keep people safe from Potentially Harmful Apps (PHAs) that may put their data or devices at risk. Our ongoing work in this area requires us to find ways to track and stop existing PHAs, and anticipate new ones that haven’t even emerged yet. Over the years, we’ve built a variety of systems to address these threats, such as application analyzers that constantly review apps for unsafe behavior, and Verify Apps which regularly checks users’ devices for PHAs. When these systems detect PHAs, we warn users, suggest they think twice about downloading a particular app, or even remove the app from their devices entirely. We constantly monitor threats and improve our systems over time. Last year’s data reflected those improvements: Verify Apps conducted 750 million daily checks in 2016, up from 450 million the previous year, enabling us to reduce the PHA installation rate in the top 50 countries for Android usage. By the end of 2016, only 0.05 percent of devices that downloaded apps exclusively from Play contained a PHA; down from 0.15 percent in 2015. Still, there’s more work to do for devices overall, especially those that install apps from multiple sources. While only 0.71 percent of all Android devices had PHAs installed at the end of 2016, that was a slight increase from about 0.5 percent in the beginning of 2015. Using improved tools and the knowledge we gained in 2016, we think we can reduce the number of devices affected by PHAs in 2017, no matter where people get their apps. Last year, we introduced a variety of new protections in Nougat, and continued our ongoing work to strengthen the security of the Linux Kernel. Encryption improvements: In Nougat, we introduced file-based encryption which enables each user profile on a single device to be encrypted with a unique key. If you have personal and work accounts on the same device, for example, the key from one account can’t unlock data from the other. More broadly, encryption of user data has been required for capable Android devices since in late 2014, and we now see that feature enabled on over 80 percent of Android Nougat devices. New audio and video protections: We did significant work to improve security and re-architect how Android handles video and audio media. One example: we now store different media components into individual sandboxes, where previously they lived together. Now, if one component is compromised, it doesn’t automatically have permissions to other components, which helps contain any additional issues. Even more security for enterprise users: We introduced a variety of new enterprise security features including “Always On” VPN, which protects your data from the moment your device boots up and ensures it isn't traveling from a work phone to your personal device via an insecure connection. We also added security policy transparency, process logging, improved wifi certification handling, and client certification improvements to our growing set of enterprise tools. Working together to secure the Android ecosystem. Sharing information about security threats between Google, device manufacturers, the research community, and others helps keep all Android users safer. In 2016, our biggest collaborations were via our monthly security updates program and ongoing partnership with the security research community. More than 735 million devices from 200+ manufacturers received a platform security update in 2016. We released monthly Android security updates throughout the year for devices running Android 4.4.4 and up—that accounts for 86.3 percent of all active Android devices worldwide. Our carrier and hardware partners helped expand deployment of these updates, releasing updates for over half of the top 50 devices worldwide in the last quarter of 2016. We provided monthly security updates for all supported Pixel and Nexus devices throughout 2016, and we’re thrilled to see our partners invest significantly in regular updates as well. There’s still a lot of room for improvement, however. About half of devices in use at the end of 2016 had not received a platform security update in the previous year. We’re working to increase device security updates by streamlining our security update program to make it easier for manufacturers to deploy security patches and releasing A/B updates to make it easier for users to apply those patches. 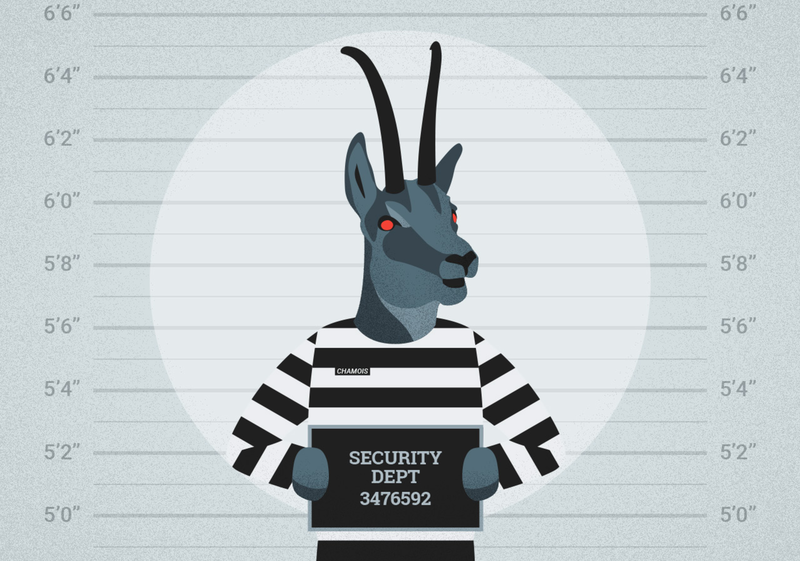 On the research side, our Android Security Rewards program grew rapidly: we paid researchers nearly $1 million dollars for their reports in 2016. In parallel, we worked closely with various security firms to identify and quickly fix issues that may have posed risks to our users. We appreciate all of the hard work by Android partners, external researchers, and teams at Google that led to the progress the ecosystem has made with security in 2016. But it doesn’t stop there. Keeping users safe requires constant vigilance and effort. We’re looking forward to new insights and progress in 2017 and beyond. We’re thrilled to be joining the security research community at Nullcon this week in Goa, India. This is a hugely important event for the Google Vulnerability Rewards Program and for our work with the security research community, more broadly. To mark the occasion, we wanted to share a few updates about the VRP. Since the launch of our program in 2010, Google has offered a range of rewards: from $100 USD for low severity issues, up to $20,000 USD for critical vulnerabilities in our web properties (see Android and Chrome rewards). But, because high severity vulnerabilities have become harder to identify over the years, researchers have needed more time to find them. We want to demonstrate our appreciation for the significant time researchers dedicate to our program, and so we’re making some changes to our VRP. Starting today we will be increasing the reward for “Remote Code Execution” on the Google VRP from $20,000 USD to $31,337 USD. We are increasing the reward for “Unrestricted file system or database access” from $10,000 USD to $13,337 USD as well. Please check out the VRP site for more details and specifics. Also, we are now donating rewards attributed to reports generated from our internal web security scanner; we have donated over $8000 to rescue.org this year so far. Cloud Security Scanner allows App Engine customers to utilize a version of the same tool. In 2016’s VRP Year in Review, we featured Jasminder Pal Singh, a longtime contributor who uses rewards to fund his startup, Jasminder Web Services Point. He’s emblematic of the vibrant and fast-growing computer security research community in India. 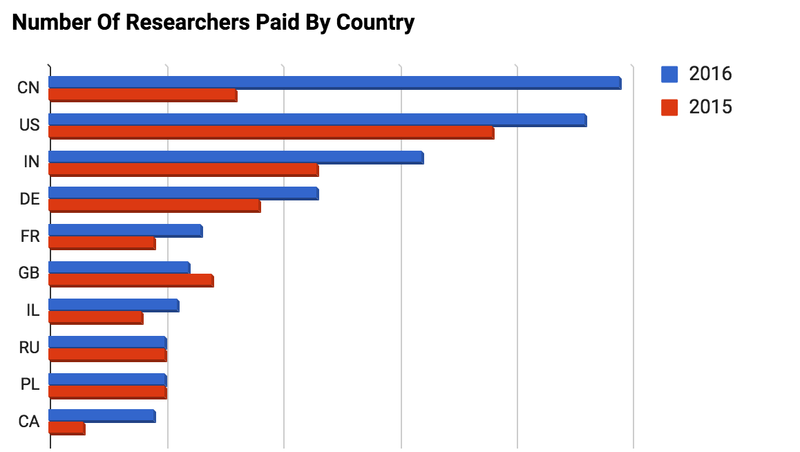 We saw that new momentum reflected in last year’s VRP data: India was surpassed only by two other locations in terms of total individual researchers paid. We received reports from ~40% more Indian researchers (as compared to 2015) and gave out 30% more rewards which almost tripled the total, and doubled the average payout (both per researcher and per reward). We are excited to see this growth as all users of Google’s products benefit. Globally, we’ve noticed other interesting trends. Russia has consistently occupied a position in the top 10 every year the last 7 years. We have noticed a 3X increase in reports from Asia, making up 70% of the Android Security Rewards for 2016. We have seen increases in the number of researchers reporting valid bugs from Germany (27%), and France (44%). France broke into our top 5 countries in 2016 for the first time. In 2016, we delivered technical talks along with educational trainings to an audience of enthusiastic security professionals in Goa at the Nullcon security conference. This year, we continue our investment at Nullcon to deliver content focused on the growing group of bug hunters we see in India. If you are attending Nullcon please stop by and say “Hello”!